WOLA predicts that, within a few months, migration numbers will increase from their present levels, despite the Trump administration’s tough rhetoric. These numbers are unlikely to return to the unusually high levels of late 2016 which, as we note in the discussion of migrant smuggling below, were also part of a “Trump effect.” Instead, monthly apprehensions are more likely to return to a level that is a rough average of the current extremely low amount and late 2016’s extreme highs. That seems to be happening now. 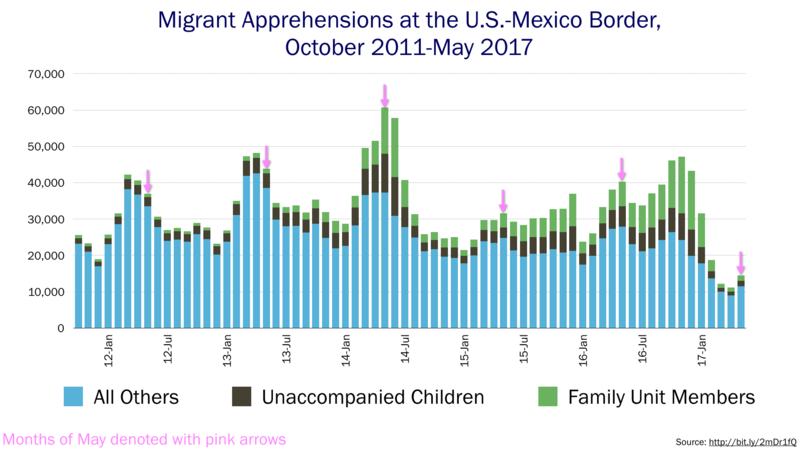 Customs and Border Protection released new data today on the number of migrants apprehended at the U.S.-Mexico border during the month of May. For the first time since Trump was inaugurated, this number is creeping up again. Apprehensions of unaccompanied children, most of them from Central America’s “Northern Triangle” countries, rose a surprising 50 percent. Apprehensions of members of “family units”—at least one parent and child, again mostly from the “Northern Triangle”—rose 41 percent. The overall number of apprehensions is still lower than February, and far lower than the final months of the Obama administration. Still, the May percentage increase was much sharper than a standard April-May seasonal rise. There’s no way to know whether this is a trend: for all we know, migration could decline again. But it’s a timely reminder that high levels of violence persist in Central America, and that migrant smugglers aren’t planning to go out of business.